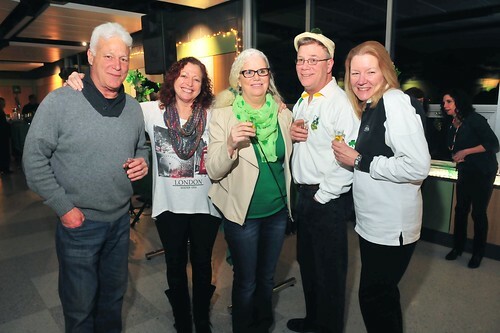 Dine & Donate – throughout the year…Stay-tuned to the Irish Times weekly email newsletter for dates and details. Amy’s Omelette House Dine & Donate – Saturday, October 20, 2018, 7AM-11AM Mention CCHS when ordering & paying bill! 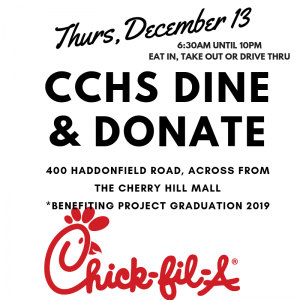 December Dine & Donate @ Chick Fil A-Thursday, December 13, 6:30 a.m.-10 p.m. Across from Cherry Hill Mall, mention CCHS when ordering. January Dine & Donate @ Chipotle-Tuesday, January 8, 4-8 p.m. 818 Haddonfield Road, Cherry Hill. CLICK HERE FOR FLIER-must show for CCHS to receive credit. Bag Bingo Basket Blowout – May 3, 2019 | Doors open 6:00, Bingo @ 7 p.m.
*Project Graduation is an all-night drug- and alcohol-free celebration for the graduating senior class. Events are held throughout the year to help raise funds for this special event. Thanks to the hard work of the 2017-2018 Parents Association. We were able to donate funds for CCHS improvement projects including a new sound system for the Grandi Auditorium. Thanks to all of those who helped support the Parents Association and our many endeavors throughout the year. The Parents Association raised over $20,000.00 during the 2017-2018 year.